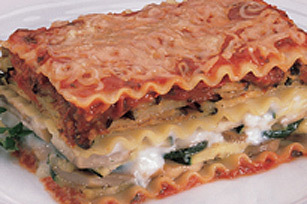 Oven ready lasagna noodles layered with vegetables, cheese and Garlic & Herb Pasta Sauce. Heat 1 Tbsp. oil in a large frypan. Cook zucchini and mushrooms 5 minutes or until tender. Remove from pan and set aside. Add remaining oil to pan and cook eggplant 5 to 8 minutes. Melt butter in a medium saucepan over medium heat. Stir in flour and cook for 1 minute. Whisk in milk; cook and stir until thickened and bubbly. Remove from heat and stir in 1 cup cheese. Heat pasta sauce to a boil. Pour 1/2 cup pasta sauce into bottom of 13x9x2-inch baking pan. Place 3 lasagna noodles over sauce and top with zucchini mixture and cheese sauce. Add 3 noodles, eggplant and 1 cup pasta sauce. Top with 3 more noodles and remaining pasta sauce. Sprinkle with remaining cheese. Cover with foil and bake at 350°F for 20 minutes. Uncover and continue baking for an additional 15 to 20 minutes, or until bubbling. Let stand 10 minutes before serving. If desired, substitute above vegetables with other vegetables such as cooked broccoli, green beans, carrots, onions, and spinach. A good source of calcium and a moderate source of dietary fibre.